If you have the need to make items of basic sportswear, swimwear or even intimate apparel then you will most probably being using a reasonably high stretch fabric to make the garment from. This shows a normal technique to elasticate edges on leg openings, armholes, sleeve ends and in some cases neck openings using natural rubber rather than the old fashioned stranded elastic. The rubber used is 8mm that comes in a large box that is coated in something like talcum powder so it does not stick together. I bought a big box of it years ago and have used about one third of the box. The advantage of using the natural rubber is it is very robust and lasts far longer than old fashioned stranded elastic. 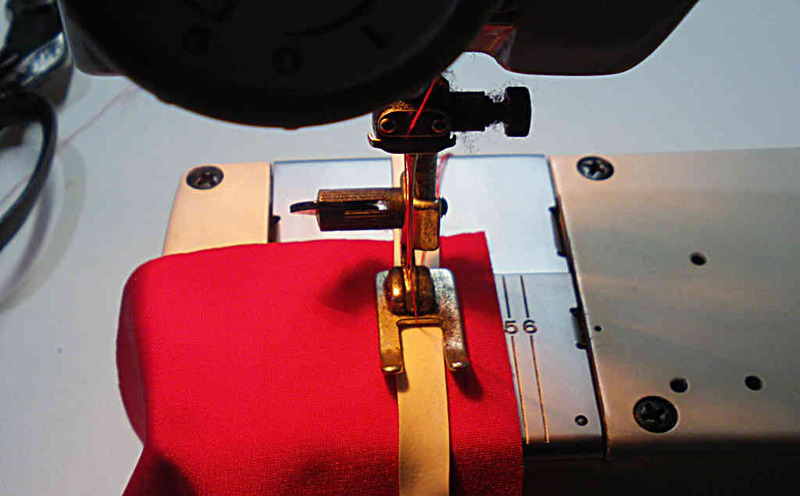 In most cases the fabric will fail before the edging fails. This is the basic materials used, nylon Lycra and the 8mm wide natural rubber. If you own an attachment for an overlocker that is an elastic feeder and you know how to use it properly, you can bypass this step but if not, this is how to attach the rubber to the Lycra before it is overlocked onto the Lycra. You use a wide zig zag with a reasonably long stitch length to allow for enough stretch. You then overlock the natural rubber onto the Lycra making sure you run the elastic edge close to the overlocker cutting knife so you get a tidy edge. This is the top side of a finished edge, in this case it has been turned inwards twice so that the Lycra covers the inside edge as well and stitched with a wide zig zag with a long stitch length. The double turning matters to some people who find an overlocked edge a bit scratchy. Many only turn the edge once which works fine if scratchiness is not a problem and this of course varies with what fabric is used. This is the inside of the finished edging which shows the Lycra on the inside face as well. The target range for stretch wear is reasonably large so if you have kids that are gym junkies or you want to keep an eye on what they wear at the beach, a hubby that is into rock climbing or a customer that wants dance of gymnasium leotards, this is a technology you can use to make professional quality garments that are robust and look good. Now in the following video, a Serbian athlete Ivana Spanovic is jumping near world record and 6.85 metres and while the person responsible for the video seems to be far more interested in pretty girls than their athletic prowess, it does show you just how hard some clothing in the sports area is hammered in competition, in this case for a long jumper, a feet and behind first landing. This is among the reasons why you make sports wear very robust. Re: Stretch edging on high stretch Lycra. Hutch what source did you use for your rubber? I had seen this rubber in my son's sweat pants when I took apart the hem to put in leg zippers. In his case the rubber was a complete band, like a very robust rubber band. The sweats were Hanes and the rubber band was not stitched down but completely enclosed in the hem but I have seen your technique in the waist of a pair bike shorts I tore down to copy. Thanks for the tip. I've saved it to my computer for future reference. I got it from a supplier here in Australia which is not much use to you. Its called "raw rubber" and came in a 5 kilo box. I could find it on Alibaba from China but I don't know my way around US haberdashery suppliers and could not find any in the US from local haberdashery suppliers. Here in OZ you can routinely get the 8mm that I used but wider sizes seem to be special orders. For waistbands I mainly use a woven elastic because it has very long life, usually exceeds the fabric life but for the legs of cycle shorts the 8mm raw rubber is a good choice. The "grip elastic" used in many commercial cycle pants is too strong and cuts the circulation where with the 8mm raw rubber you get a close smooth edge without it making your legs go numb. Thanks for that info, Hutch. I will do some snooping around and see if I can't find it. I don't have any problem with the chlorine resistant swimwear elastic so if I cannot find it, not a big problem. With the bike short legs I found that I had to change the ratio with the gripper elastic to almost 1:1 to get a comfortable fit. I got that tip from Penny Schwyn who specializes in repairing outdoor gear here in the States. She also has some decent tutorials on bike shorts and jerseys. What is the line that can do me a favor? I want to know a lot. Nice post! I also bought a Lycra mesh cut out leggings recently, the material is so soft and comfortable that you feel like wearing it all day long. I even go for casual lunches in these leggings. This is a very informative post, definitely shareable.